Detroit-style pizza at Iron Born in Smallman Galley. Photo by Jason Waltenbaugh. 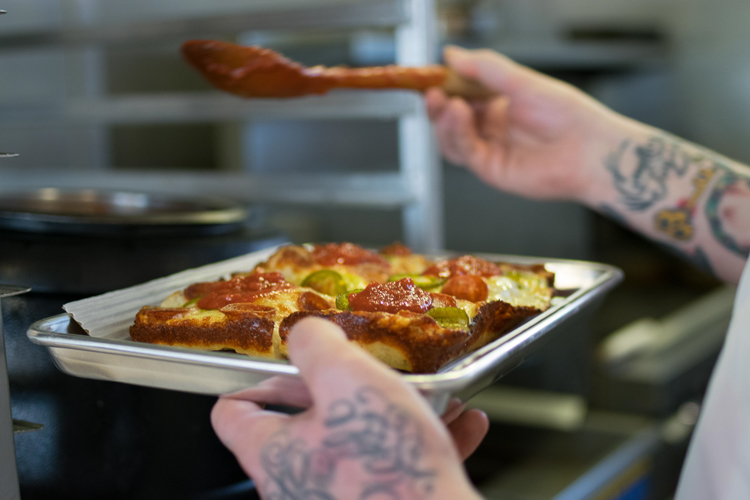 When Michigan & Trumbull opens in the North Side’s Federal Galley food hall in a few weeks, it will join Smallman Galley’s Iron Born as the second shop to launch this year serving “Detroit-style” pizza. If you’ve never heard of “Detroit-style” pizza, you’re not alone. 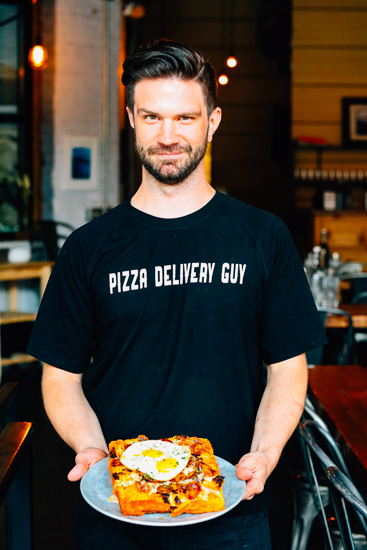 Chef Pete Tolman of Iron Born Pizza with one of his “Detroit-style” creations, The Brunch Pie. Photo by Tom O’Connor. The key is the small, thick steel pans in which the pizzas are baked. The result is a soft and airy crust with a crunchy exterior and caramelized cheese along the edges. The idea to use the pans goes back to 1946 at Buddy’s Pizza in Detroit. According to rustbelt legend, the downtown pizza maker, looking for something to cook his pies in, stumbled on a lot of trays used to hold small parts on the assembly lines in the local car factories. He repurposed an unused batch as his new pizza making vessel. The small, rectangular steel trays lean more toward cast iron than cake pans, resulting in the perfect combination of light on the inside and crunchy on the outside. Pittsburgh native chef Pete Tolman of Iron Born uses a two-day fermentation process to create his flavorful, cloud-like dough, but credits the same kind of small steel pans for getting the caramelization and crunch just right. On some pies, he also uses another popular “Detroit-style” reverse-layering process where ingredients are baked into the crust with the sauce poured on top. “We often get customers who say our pizza reminds them of Buddy’s,” says Tolman. Buddy’s Pizza and its offshoots are still favorites in the Motor City, and well-known in the Great Lakes region. Inspired by the cooking method, Tolman decided it would be the perfect concept to introduce to his hometown with his now very popular Smallman Galley venture. 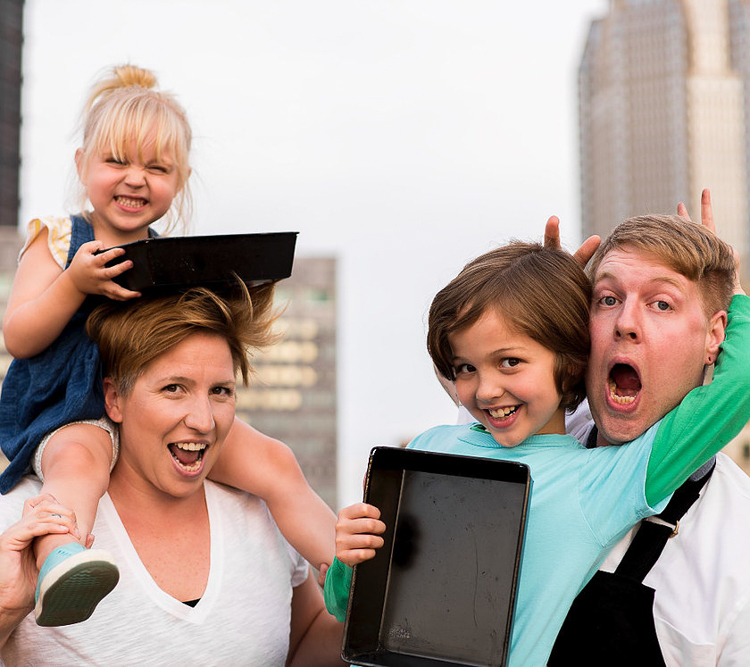 Kristen Calverley and Nate Peck, the chef-owners behind Michigan & Trumbull with their kids Wren and Oliver (and the famous steel pans). Photo by Zack Eisenfeld. In contrast, the couple behind Michigan & Trumbull (named for the cross streets where the original Detroit Tiger’s Stadium was located) are both Detroit natives, but they followed a similar inspiration. Nate Peck is a chef at Point Brugge Café in Point Breeze and Kristin Calverley is a server at Girasole in Shadyside. “After moving here, we were looking for the pizza we grew up with but couldn’t find anything similar, so we decided to make it at home and for friends,” says Calverley adding “It’s deep dish, but still really light, and nothing beats the crunchiness of the bottom and the sides.” Getting a corner piece is key and the small trays make that easy. 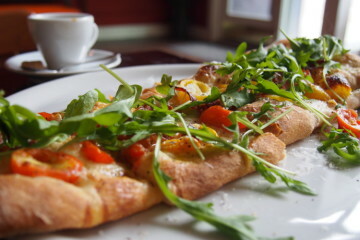 Peck, the man behind the amazing Liege waffles, among other things at Point Brugge, uses a French poolish method or “a starter” to get the cake-like texture for his pizza crust. It requires a longer fermentation process for dough similar to chef Tolman’s approach at Iron Born. “I kind of got obsessed with it,” says Peck describing his process for finding just the right dough recipe. 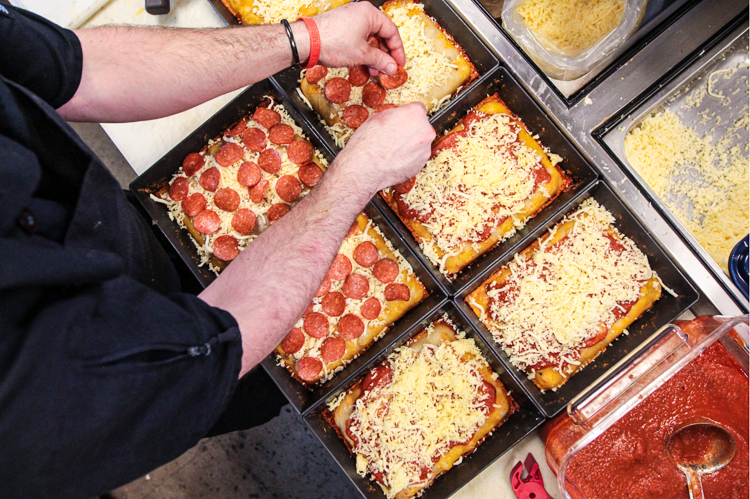 Prepping the “Detroit-style” pizzas at Michigan & Trumbull’s recent pop-up event. Photo by Christopher White. As they prepare to open, Peck and Calverley have been honing menu ideas with local pop-ups at The Vandal and Pear and the Pickle. They’ve already got the requisite steel trays and have been carefully seasoning them to make them “pizza-ready.” A Detroit-based company has now made the unique trays available for purchase. Michigan & Trumbull’s pizza menu features nods to Detroit with names like “Woodward Avenue White” and “Vernor Vegan.” There’s also Packard Pepperoni featuring the much-loved cupping pepperoni right on top because “you gotta have the little grease cups,” says Peck laughing. 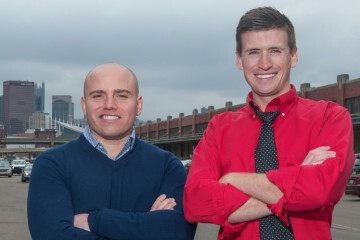 Much like Iron Born, they plan to expand their menu beyond just pizza offerings. Eager to find out why “Detroit-style” is winning over so many pizza lovers? Check out Iron Born’s slate of pies at Smallman Galley including their newest menu additions, Kale and Philadelphia Cheese Steak — and don’t forget about their famous brunch pie. Sample Michigan & Trumbull’s pies at their upcoming pop-up event at Pear and the Pickle in Troy Hill on November 6. Federal Galley is expected to open in late November.